World War I was a pivotal event in human history. Much of the conflict, turmoil and suffering of the 20th century can be traced back to the great conflict of 1914-18. As every good student knows, World War I was triggered by the murder of a minor Austrian royal in Sarajevo. The true causes of the war, however, can be found in the geopolitics of 19th and early 20th century Europe. World War I was the child of several political, ideological and cultural parents. Nationalism inflated confidence to the point of arrogance and set European rivals against each other. Militarism created a fascination with military power, fuelled a European arms race and fostered an expectation of war rather than a dread of it. The alliance system divided Europe into two belligerent halves and welded nations together in a commitment to war. Imperialism drew Europe’s ‘Great Powers’ into competition for ever diminishing territory and resources. The Balkan peninsula – with its instability, war and continuing crises – provided a mixing bowl for these European tensions, rivalries and hatreds. When Archduke Franz Ferdinand was gunned down in June 1914, it set Europe on an almost inevitable path to war. For the next four years, the European continent was divided, ravaged and scarred by the horrors of industrial warfare. Millions of young men were recruited and conscripted, trained and equipped then marched off to war. 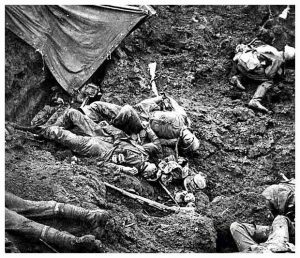 On the Western Front, men were cut down by machine-gun fire at Ypres, blown apart by artillery at the Somme or drowned in mud at Passchendaele. Fighting raged in a host of other regions including Eastern Europe, the Balkans, the Middle East, southern Africa, the Asia-Pacific and on the high seas. The war robbed a generation of its young men, decimated families and left millions stateless, homeless or permanently disfigured. It caused untold property loss and destruction. It cast nations into debt for generations to come. It destroyed empires, dynasties and governments, triggered revolutions and gave birth to political radicalism. Post-war treaties redrew the map of Europe, punishing the defeated and perpetuating wartime hatreds instead of resolving them. The most catastrophic outcome of this ‘war to end wars’ was the death of German democracy, the rise of Nazism and an even deadlier world war, two decades after the first.